As with every condition in medicine, phlebitis can appear in several ways. Although the following description is the classical presentational phlebitis, it is important to note that not everyone with phlebitis will have all of the symptoms and signs described here. 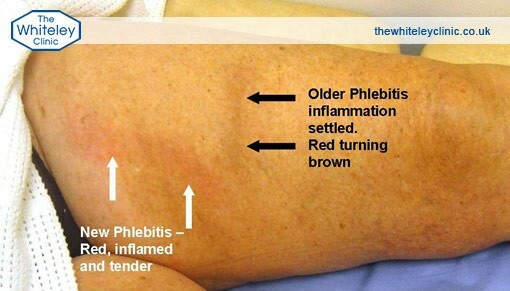 Most patients with phlebitis either get a sudden onset of the symptoms and signs, or a gradually increasing set of symptoms or signs over a day or two. The first symptom is usually discomfort, tenderness or pain in one area of one leg (very occasionally two legs). This discomfort, tenderness pain is localised to one area usually running up the leg in the line of a vein. Depending on the vein affected, this might be vertically up the inner part of the thigh, diagonally across the upper thigh at the front, vertically up the inner aspect of the calf, vertically up the back of the calf or if there have been varicose veins before, phlebitis can be a series of lumps anywhere on the leg in the same position that the varicose veins had been. Because the phlebitis is caused by a clot in the veins, the vein wall becomes inflamed and so the overlying skin also becomes inflamed. Therefore the skin overlying the area of phlebitis is usually red (unless it is very deep) and as the inflamed vein is under the skin, is usually tender to touch particularly if you push hard. If the vein is superficial enough, a hard, lumpy, tender “tube” can be felt under the skin which is the clot and inflamed vein wall under the skin. If it is a set of varicose veins that have become thrombosed in the phlebitis process, then the lumps may feel more diffuse with one or more rounded mounds felt instead. However they will still be hard to the touch and tender on pushing. There are a host of other conditions that are mis-diagnosed as phlebitis. It is unfortunate that so many doctors and nurses use the term “phlebitis” whenever they see any inflammation or have a patient complain of a tender area in the lower leg. Not only is this usually an incorrect diagnosis but it often leads to the wrong treatment. Severe haemosiderin and venous eczema of ankle and calf Venous eczema (or varicose eczema), lipodermatosclerosis, haemosiderin deposition, venous leg ulcer – all of these conditions are variations on the same problem, that of venous incompetence and venous reflux disease but without the clotting of blood in varicose veins or hidden varicose veins. In these patients, the valves are not working in the leg and so when the leg relaxes, blood reflux is down the veins hitting the capillaries (very small blood vessels) in the skin at the ankles. Unlike phlebitis, where this process causes clots in the veins, in these cases the refluxing venous blood causes small amounts of trauma to the small vessels in the lower leg. Although this does not have any immediate effect when it starts, after many years of repeated trauma, the tissue around the capillaries becomes inflamed and the skin starts to react. At first it gets irritated (venous eczema or varicose eczema), then it gets hardened and a little swollen (lipodermatosclerosis), then it goes brown (haemosiderin deposition) and finally it breaks down, causing a venous ulcer. 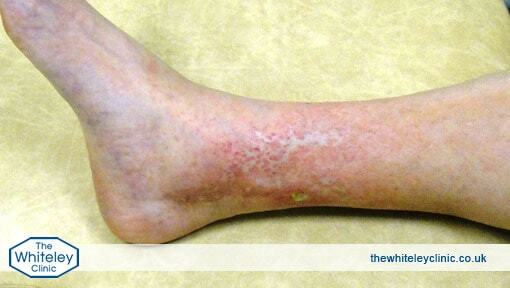 Atrophie blanche – skin of ankle is about to break down into a venous leg ulcer. The cause is venous incompetence causing venous reflux disease (or “hidden varicose veins”). This is NOT phlebitis. In all of these conditions, the treatment is to stop the blood from refluxing down the veins – in other words to investigate and treat the venous incompetence stopping the venous reflux. This is completely different from the treatment of phlebitis.